Finding the most suitable work boot can make your life easier and safer, as we all know how it feels like to be wearing uncomfortable boots all day long, or have freezing and wet feet all day. Many companies have very specific requirements for the type of safety shoes you must wear at work. If you are in construction, work with heavy machinery, carry heavy items and materials, chances are that you need safety toe work boots. The steel toes are the traditional safety caps, and are still one of the most preferred safety toe type. The thing is, steel is the heaviest safety toe alternative, so you need to be aware of that and of several other factors when you are picking suitable steel toe boots for yourself. We made a detailed assessment of a wide variety of such boots available out there, and have chosen our top picks for you. These 6” Titan work boots are an amazing combination of safety, quality and comfort. No wonder this is one of the most popular safety shoe collections ever. 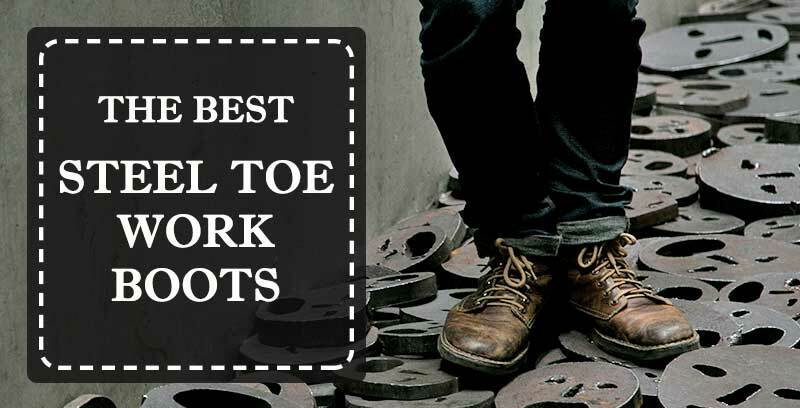 They are also awesome for help with heel pain, so they are great for people suffering from heel problems and are our favorite best steel toe work boots for plantar fasciitis. – The PRO rubber outsole which is oil and slip resistant. – The 30 day comfort warrantee – if you do not like them, you can return them within 30 days with no questions asked. These safety toe boots look great, and they provide the comfort and safety needed for your workplace, as well as for hiking or sending time outdoors. – The comfortable and cushioned polyurethane midsole features a special high-rebound heel insert for double cushioning and the patented Energy ReturnPowerfit bounce back to reduce fatigue. The type of safety toes – do they comply with the requirements of your company, are they ASTM rated, are they safe for electrical hazard? Always pick the oil and slip resistant outsole – spills can occur just about anywhere, so you better be on the safe side. Depending on the kind of work you are in, you can also look for acid resistant or puncture resistant ones. Consider getting safety boots with additional protection, such as metatarsal guards, or with ankle or calf support if your workplace has such hazards. Eliminate the risk of getting electrocuted at your job, by picking electric hazard rated shoes with steel toes. Of course, it is preferable if you get waterproof boots or insulated boots if you work outdoors or inside in wet and cold conditions. Ask about the breathability and moisture control of the boots, because you will be spending hours and hours in them, and you want your feet to feel and smell fresh at all times, right? Consider the break-in time which will be required to get these boots comfortable and wearable. Of course, look for the boots which best suit your needs and feel the most comfortable and safe. Read our Men’s Work Boots Reviews to see which our of hand-picked options will best suit your needs. The idea is to reduce any fatigue or soreness and to reduce the risk of injury at your workplace, or wherever you are planning on wearing your safety toe boots. So, here are our recommendations for lace up footwear. If you are looking for other options, check our guide to the most comfortable slip on work boots. Happy searching!